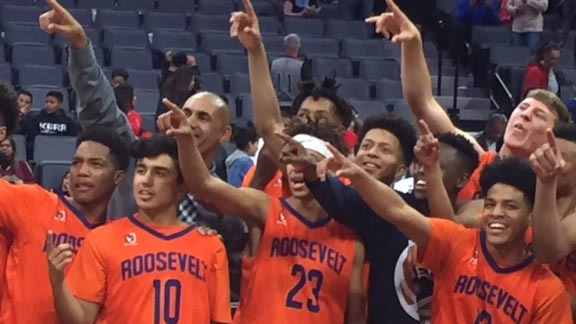 Some of the players from Roosevelt of Eastvale are shown pointing at the scoreboard after they defeated Logan of Union City in the CIF Division I state final. Photo: Mark Tennis. As is another of our traditions, we present our expanded, final Top 40 overall boys basketball team rankings, this time covering the 2016-17 season. The team getting a bump based on the CIF state finals is D2 state champ Esperanza of Anaheim. Did D3 champ Mission of San Francisco make the cut? Only one team among the final top 20 wasn’t on our pre-season radar and probably should have been. For our analysis and writeups on all 40 teams, check out this post. If you can’t see this post, it’s easy to become a Gold Club member to see the final state rankings that will go in our record book plus all of our other unique content. For sign up info, CLICK HERE. For final CIF divisional state rankings (also expanded & also Gold Club) and lists of teams to watch for next season, CLICK HERE. For Gold Club archive of final State Top 20 rankings back to 1993 (first year we did them), CLICK HERE.